I am a dreamer who chased her dream to live and become a dentist in the free country that is the United States, where the sky is the limit. I quit my successful dental practice in Russia and moved to LA with my 8 year old daughter—without any English or anyone in the U.S. I was getting only 4 hours of sleep a night, first studying English, then studying for the National Dental Board. Due to this lack of sleep, I honestly could barely walk, but failure was not an option for me. My hard work payed off and I passed the National Dental Board Exam with the highest score in the nation. Then, I got accepted into the Ivy League UPenn Dental, despite of many people’s opinions that it’d be impossible for me to get in. I was an honors student and after graduating, I was one of the few people who got accepted to UCLA postgrad. Working as an associate for someone else made me realize that I want to be my own boss and treat people the way I want to treat them, the way that they should be treated: with fairness. The location I chose was the city where I live, the city where my daughter graduated from High School—Beverly Hills. Again, everyone was telling me that it’s very risky and to open somewhere else, not “in an area with many ‘celebrity’ dentists” in every building. I am very confident with my knowledge and experience in Dentistry and I am not afraid of any competition. Beverly Hills is my home; it’s the place I want to work in and help my community as much as I can. Now, a successful year has passed and I have people reaching out to me and apologizing to me for ever doubting me. Every step I have taken in my career, I was fearless. I strongly believe that if you dream big and work hard enough, you can accomplish anything in this great country. What drives me is seeing my patients leave the office after an appointment with a big smile on their face. These are the most rewarding moments for me—when kids who were always put to sleep or were refused to be treated without general anesthesia allow me to treat them while they are wide awake, or when I see people who constantly used calming drugs before dental appointments not having to use them after they experience my pain free, gentle dentistry. Or when kids leave my office and tell me they want to be a dentist just like me. In addition, what has driven me all my life is being able to prove to people that I can accomplish anything I put my mind to, no matter what doubt or negativity is thrown my way. We’re the most advanced, high-tech Biological Dentistry office (invested more than million dollars in our equipment) in the heart of Beverly Hills. We offer superior patient care. At Beverly Hills BioDental, we work with only biocompatible materials—no metals—only pure zirconia implants, and same day metal free crowns. We use a new generation 3D imaging machine, capturing so much data in a single X-Ray without any film strips or sensors in the mouth for quicker and more accurate diagnoses. This leads to more efficient patient treatment. About 95% dentists have X Ray equipment in their office which is 2 Dimensional. 2 Dimensional X Rays only show the width and height of the tooth, NOT the depth. Our new generation 3D diagnostic images can show that a tooth may not be fine even if it looks normal on a 2D X-Ray. Unlike a regular X-Ray, 3D images will be able to pinpoint any pathology or chronic infections that may be silently jeopardizing a person’s health. We truly believe in correlation between chronic illnesses and dental etiology. The vast majority of chronic degenerative diseases begin with problems in the mouth. The blood supply in the mouth will take any toxins to the lymphatic system and take it down to the thyroid, thymus, and rest of the body. 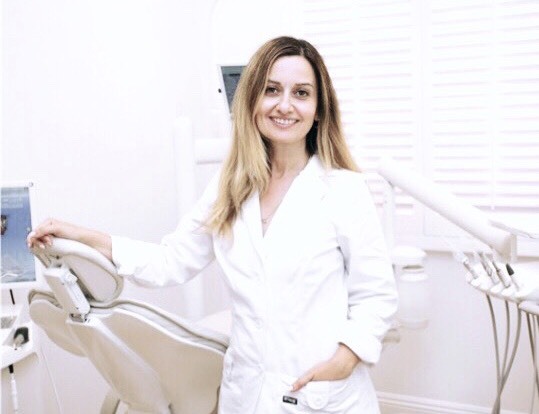 At Beverly Hills BioDental, my main concern and project is getting the word out about the importance of biological dentistry, in hopes that people will choose wisely about what they put in their bodies. In our office, crowns are fabricated the same day you come in, no need for a temporary crown or second appointment for a crown delivery. Not to mention, our whitening system is different from many offices. Studies show that teeth whitening can cause more damage to teeth due to duration of contact. This longer exposure time may increase the risk of injury to the surface of teeth, including permeability and dehydration, that’s why teeth become sensitive. We offer patients the most advanced laser teeth whitening in one 30-minute session. It’s fast, absolutely safe, and painless for even the most sensitive teeth. We have only one set of teeth for our entire life; consistent, proactive care is essential. Our futuristic-designed practice is stress free, pain free, and a spa-like environment—not the dentistry that most people used to know. I am influencer in the PR industry. I have worked with clients worth over 100M. My goal is to share my experiences and influence others to find success while sharing valuable and interesting content.